513 pieces of hand cut stained glass and 10 jewels are used to make this elegant transom window, featuring a floral medallion flanked with translucent figure eights and bordered in matching glass. 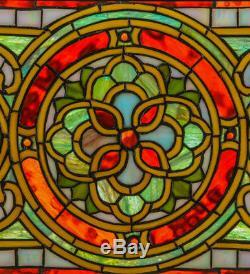 Topaz, Moss and Burgundy are the prime colors of this Tiffany style window. A solid brass hanging chain and brackets are included. Specifications: Total Height: 11" Total Width: 35" Total Weight: 6 lbs. Product must be in new condition and in the original, unopened packaging. We are a small family owned business focused on our customers. Customer service is our top priority! 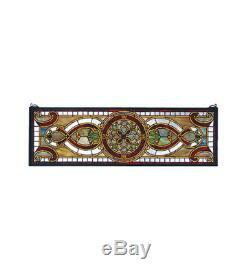 The item "Evelyn in Topaz Transom Tiffany Style Stained Glass Window Panel 35W X 11H" is in sale since Sunday, January 28, 2018. This item is in the category "Antiques\Architectural & Garden\Stained Glass Windows". The seller is "lovingmydecor" and is located in Yorkville, New York. This item can be shipped to United States.